Eight Pontiacs made Hemmings "Top 100 American Collector Cars of All Time"
This one-year-only Bonneville has it all: Individual styling, spectacular fins, well-appointed interior, powerful 317hp V-8, convertible top and the distinction of being equipped with the rare Rochester fuel injection system. All told, only 630 were made, making it one of the most sought-after collector cars from the '50s. Pontiac's Catalina-based Ventura two-door offered grace, space and pace, in an affordable, stylish package. 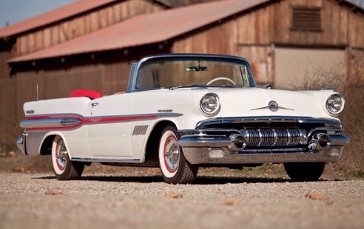 With its thin-pillared "bubbletop" treatment, Pontiac made a roof that seemed to invite the outside world in; lower production numbers than comparable Chevrolet models make the Ventura very collectible. First in a great line of automobiles sporting the badge, Pontiac's renamed Catalina coupe was one of the company's first attempts to offer a more European feel in its line. Minimal chrome, bucket seats, console and floor shifter were welcome changes, as were the 303hp V-8, inviting split grille and those distinguishing taillamps. There is an understatement to the 1965 GTO that collectors and enthusiasts alike groove on. The basics shared the upright, crisply folded lines of the 1965 Tempest, with its new stacked-headlamp face and wraparound taillamps. Enhanced by its stylish wheels, hood scoop, dual exhaust and some subtle badging, this GTO's proportions are perfect. Any time a car is produced for only a single season, it invites collector attention. Not only was the body style a one-year-only design, but this was the only Grand Prix ever offered as a convertible; just 5,857 were built. Add in the unique eight-lug wheels and big 428-cu.in. V-8 and you have a full-size convertible that few other cars can match in terms of rarity, looks and performance. Stacked headlamps. Split grille. Hood scoop. Coke-bottle-shaped profile. Louvered taillamps. Styled steel wheels. Room for all your friends. Ballistic power. Together, they're an irresistible combination, and epitomize the term "muscle car." Although more than 81,000 1967 GTOs were built, each turned thousands of heads, and continues to do so today. Just 689 hardtops and eight convertibles were built, making first-year Trans Ams a rarely seen muscle-era treat. All were white with blue stripes, and all received a Trans Am-only decklid spoiler; the mandatory heavy-duty suspension spoke to the T/A's unrealized SCCA road-racing hopes and dreams. Only Pontiac truly raged against the dying performance light by offering their Super Duty package--good for 310/290 net horsepower--in 1973-'74. Dropping this very special V-8 in a low-slung, low-production sports GT like a hard-cornering Trans Am transformed it into the best all-around performance car of the era. Production ended with just 1,195 built.